are pretty serious. Meat production contributes to the global water crisis and cattle and other livestock animals generate a lot of waste and greenhouse gas. 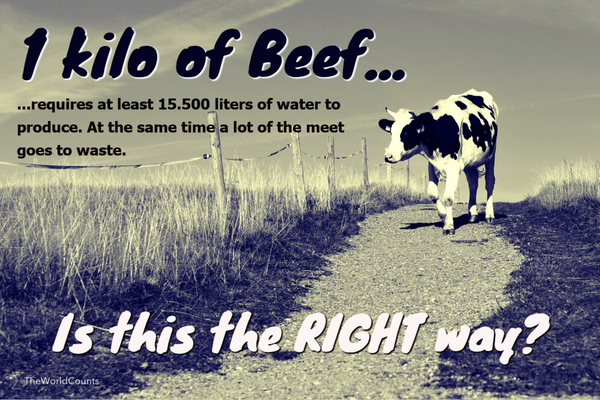 It requires at least 15,500 liters of water to produce 1 kilo of beef. In total, meat production demands more than 2,000 trillion tons of water every year (that's 63 million liters a second!). In less than 40 hours that’s enough to provide drinking water for everyone on earth for a year. The ground water level is falling dramatically in China, India and the USA. This is serious - especially as these 3 countries currently produce half of the world’s food. Worldwide, cattle and other livestock animals generate an estimated 13 billion tons of waste every year. This is the weight of the Eiffel tower every 24 seconds. The problem of what to do with this waste is increasing. Surprisingly, the burps and farts by cattle and other livestock animals account for 18 percent of global greenhouse gas emissions. That's more than the total emissions from the transport sector. Global meat consumption is the following: Beef: 0.064 gigatons, sheep & goat: 0.012 gigatons, pork: 0.100 gigatons, poultry & egg: 0.139 gigatons. Water use per kilo of meat is the following: Beef: 15,500 liters, sheep & goat: 5,050 liters, pork: 4,800 liters, poultry & egg: 3,600 liters. This gives a total of 2,033,000,000,000 tons of water Estimates of water use from meat production vary. For example, some estimates put water use for 1 kilo of beef at an astonishing 100,000 liters. Interested in more facts like the water use in meat production? Then plug in and subscribe to our newsletter.